When it comes to flooring, some materials can withstand pet-related wear and tear better than others. But choosing durable flooring doesn’t have to mean sacrificing style or spending a fortune. There are many types of pet-friendly flooring that blend durability, style, and value. Here are a few materials proven to stand up to pet messes, nails, or claws. Natural flooring options -- such as stone, tile, or concrete -- are good choices for pet owners, since they are scratch-resistant and easy to clean. Homeowners in warmer, southern climates can especially benefit from these types of flooring since they are naturally cool. Pet owners who live in chillier climates can easily add warmth to floors made of stone, tile, or concrete simply by covering them with inexpensive, easy-to-wash rugs. However, there are a few drawbacks to choosing natural flooring options if you have pets. Tile can be slick and may lead to pet injuries if they skid across the floor. Stone can be uncomfortable for pets (especially senior animals) to sleep on, so be sure to provide comfortable bedding options. Luxury vinyl is another durable and affordable option for pet owners. It can resist moisture, scratches, and dents, all while mimicking the look of stone or wood. It can also help cut down on the noise your pet’s nails make as they walk across the floor. Laminate can also stand up to scuffs and scratches and is less expensive than wood, concrete, and most tile. Its main drawback is that the sealant that helps protect the laminate can be slippery to pets, so consider choosing a finish with some texture. Liquid messes can also damage laminate floors if they aren't cleaned up promptly. Although hardwood floor is considered one of the least durable options for homes with pets, some species of wood are more pet-friendly than others. 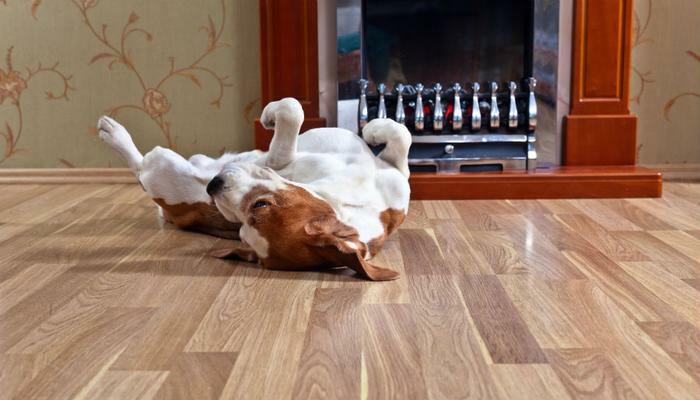 Pet owners thinking of going the hardwood route should consider choosing engineered hardwood with the most scratch-resistant finish available. Avoid soft woods (such as pine or fir) and opt for the toughest species; brazilian walnut, hard maple, or teak are good choices for pet owners. Carpet is also considered one of the least pet-friendly flooring options, but there are a few options for those who love the look and feel of plush carpet. Carpet tiles are a smart choice in homes with pets, since individual tiles can be easily replaced if they fall victim to pet-related damage. Pet owners can also look for carpet specially designed to resist pet stains and odors. For more pet-friendly home design ideas, click here.